Our title photo is courtesy of Mr. Sonam Wangchen of Bhutan and was taken in the wilds. Mr. Wangchen operates 'Bhutan Excursions and can be reached at www.bhutantour.bt for those wishing to see this rare and delicate beauty in person. 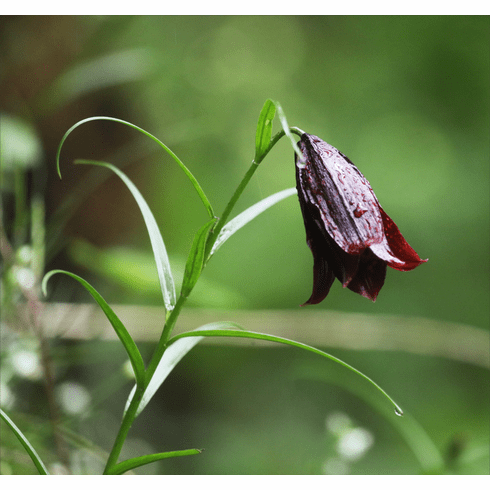 Only a hand full of people have viewed this lily in its native state while Mr. Wangchen walks along side them in an area of unsurpassed beauty. Photo copyright Mr. Sonam Wangchen, Bhutan Excursions, all rights reserved. Used with permission. Our photo inset was contributed by Julia Cordon, Head Gardener at the Explorers Garden in Scotland and also is the current President of The Scottish Rock Garden Club. She took this photo on an expedition that coidentally was led by Mr. Wangchen our other contributor. Photo copyright Julia Cordon, all rights reserved. Used with permission. Thank you Julia for this photo of a rare and unique lily.